For physical books, many times a book’s cover isn’t immediately visible, only the spine. Sure, in bookstores if you’re a big enough name or a new enough book with some buzz, you’ll get the cover-forward treatment. But a lot of their stock is displayed like a normal bookshelf – spines out. This is especially true of used book stores. And libraries, and bookshelves in homes and businesses. You get the picture. Obviously this isn’t an issue online, where the cover image rules supreme. But there are a lot more avenues to discovering a book than just browsing the web. And a book’s spine is an extension of the cover, so if you’re going through the time and trouble to have the cover designed well, why would you skip over the cover’s backbone? The extra effort required is minimal to make sure your book’s full attention-grabbing potential is reached. “Of course the full front cover can’t be duplicated on a spine. But to have the spine echo the front cover is to make the best use of both. If the image on the front cover is worth a thousand words, why not keep a few hundred’s worth on the spine? I mean, really, which of these are you more likely to pull off a shelf for a closer look? Not the one on the far left, right? It’s boring compared to the other two. A good book spine can work just as hard as the cover to draw people in. This spine perfectly distills the story in a clear image, with an easily readable title. A great example of when a spine design contrasts with the cover. Dynamic, striking spines across the series. Similar designs for an author’s brand. Coordinating designs for works by the same author that aren’t in themselves a series. A great example of the spine being a continuation of the cover art. Gothic and bold spines, that are simplified versions of the covers. Adjust the cover design to fit the spine. Relation to cover: A disconnect between the spine and cover serves no one well. The two should work together to encompass your book. You have three options with this: continue the front cover onto the spine directly, distill the front cover down into simpler imagery that will fit on the spine, or contrast the spine with the cover within the same visual feel. You can see examples of each of these above. Legibility: While there are exceptions to this, your best bet is to make sure the title is without question legible. Generally this means sticking to a sans-serif or serif typeface, rather than something scripty. Book browsers already have to crick their necks to the side to read titles most of the time, you don’t need to make it any harder on them. It also means making sure that there is enough contrast between the background color and the color of the type. The best font in the world won’t matter if the color choices mean it’s hard to read. Work with the width: Don’t be intimidated by the spine! Even a super skinny one can pack a punch, if the design is bold enough. Use its verticality to your advantage, or push the design clear to the edges of the space. Get creative to maximize this bit of cover real estate. Think beyond the single book: If your book is going to be part of a series, plan ahead! As a reader (and a designer), I LOVE when a series coordinates, especially if they combine to form a larger image. Or if you’re an author with a larger body of unrelated works, think about how your author branding can be applied to spines for consistency, making it easy for fans to pick out your works. In short, though the space be small, the impact is mighty, and you are best served by giving your book’s spine as much attention as the cover if you’re selling physical books. Have you ever been drawn in by a gorgeous book spine before? SpineSideOut for poetry composed from book spines, it’s great. Juniper Books out of Colorado, who specialize in custom book jackets and are masters of multi-book spine art. 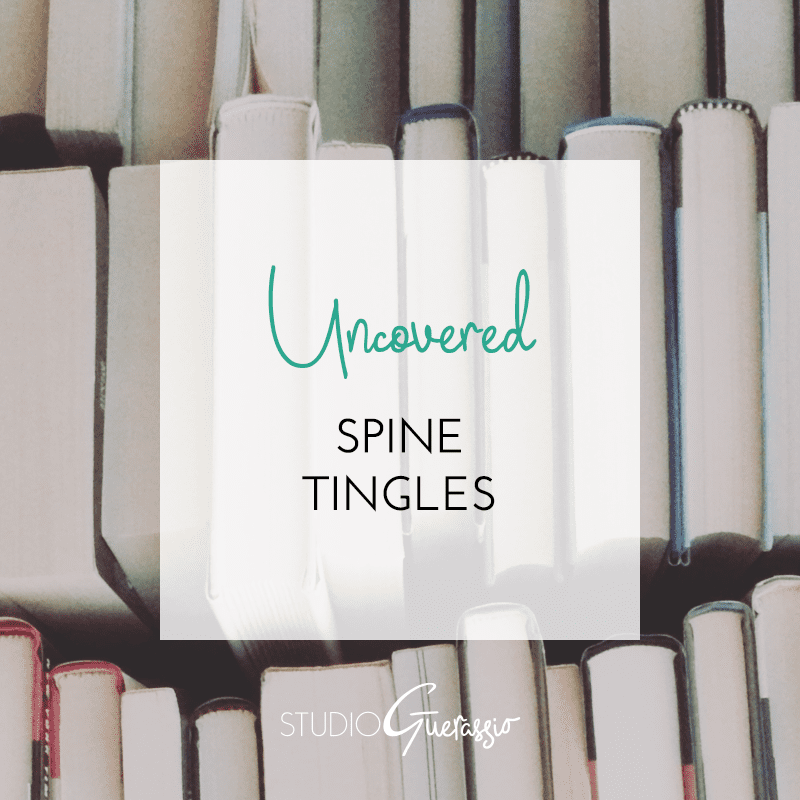 Oh a good spine is essential – half the time it’s the thing I notice first! I love it when a series has an image across the spines that’s only completed when you stand the books side-by-side! I LOVE when a series does that. You should definitely check out that Juniper Books instagram account linked above, that is their specialty.